I know, for many of you tempeh is like the 'last frontier' of vegan cookery. You see those mysterious blocks of tempeh sitting in the freezer section of your store, and pass by those foreign objects for fear of culinary defeat. No fears, my dear vegans! 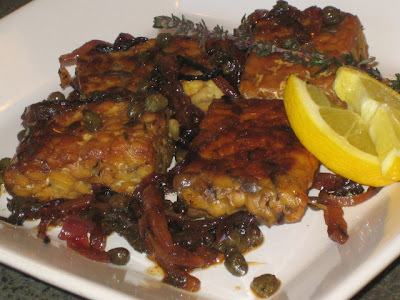 Tempeh can be delicious... and easy, like with this Lemon-Caper Braised Tempeh (new recipe). Now, with tempeh, I find it's important to infuse flavor... much like tofu. The beauty of tempeh though, is that it does have a natural nutty, earthy flavor. And while it's flavor (and texture) might take some getting used to for those accustomed to tempeh's better-known relative tofu, it is really very appealing when prepared the right way and with some of your favorite seasonings. In this recipes, tempeh slices are first pan-fried to sear both sides. <-- And just look at that golden-brown crust! That's flavah, flavah! Then, the tempeh is finished by braising in a lemon-caper sauce. I add full slices of lemon as well as fresh lemon juice to the dish, since it infuses a lot of flavor (okay, and I think it looks pretty)! But, eating those lemon slices with your meal is optional, as they are quite bitter with the rind intact. Now, 'spot the difference' in the photos! See here on the right, the lemon slices are part of the sauce... but in the large photos above, whoops, I forgot the lemon slices during that recipe trial. Which, of course meant that I then had to retest the recipe again to get a fully accurate flavor result. not that I minded too much... it was delicious enough to make again! I actually love tempeh and I'm always trying to find more interesting dishes to make with tempeh, so this dish looks amazing! You're so right; tempeh deserves more attention than it gets, doesn't it! Great recipe! Ummm ... I love tempeh! And that recipe looks delicious and perfect for summer! It looks so elegant and well balanced, reminiscent of mediterranean flavours.I'd love to try it soon; i'm sure it's as yummy as the dishes from Vive and ED&BV I tried so far! Great! vegnextdoor, it's funny because I'm working on a whack of new recipes, but I don't have a book planned as such. I guess I'm just enjoying what I love to do - create recipes - and am thinking I'll get some 'sign' of where to go with this next! Looking at the tempeh simmering in the lemon slices makes me feel like I'm in the south of France...Looks and sounds lovely, Dreena! Wow! The "uncheese" mac & cheese was outstanding. I've made many mock mac & cheese recipes and this is the best out of all of them. Whenever I make a new Dreena recipe I always say to husband, "She's brilliant!" vegnextdoor... I sure adore you. Had such a lousy day yesterday, mom stuff mostly, but still, to read first thing that you loved that dish so much... well, it has just made my morning. xo! I have found that adding lemon slices with the rind in the meal added a bitter taste.. So I am a little worried about that. Did you think the tempeh had bitterness with the lemon rind? Happy to hear that I made your day. I know all about mom stuff. This gig can be overwhelming at times, eh? Apparently my 3.5 year old told my mom that she sometimes makes "mommy upset and she cries". Some days are better than others. As a recent vegan (6 months) this is exactly the kind of cookbook that really helps me out. The flavors are out of this world! (So far I've tried the Sweet and Sour Chipotle Tempeh, Bean and Corn Tortilla lasagna, and Cumin-Cinnamon Vinaigrette) Thank you so much for all of your hard work! Wow! Another tempeh temptation. I still haven't re-tried tempeh but I haven't forgotten your suggestion to do the muffuletta. I will get around to it. Promise. I'd like to try this dish as well. I like the lemon slices on top. oh, anonymous, I missed your question. I find the lemon rind bitter if you eat it with the tempeh - but overall it doesn't make the tempeh and the other ingredients bitter - but I've also brought some sweetness into the sauce for the dish also. Even so, I don't eat the pieces of rind once cooked myself - too bitter.